The Whitefish Trail relies on the generosity of trail users, conservation-minded supporters, and local businesses. We need your commitment today to support existing trail as well as future trail and conservation opportunities. Your donation is an investment in Whitefish’s Legacy. 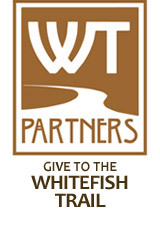 Enjoy the Whitefish Trail, be a conservation champion, and donate today! Camp fees for Whitefish Trail Friends and Families – $40 per child per week ($40) This must be a number! Camp fees for non donors – $160 per child per week ($160) This must be a number! The Whitefish Trail generates $6.4 million in consumer spending in Whitefish every year and supports 68 local jobs. We rely on support from local businesses to keep the Whitefish Trail and our local conservation lands thriving. Give back to a project that creates so much value for our community and sponsor the Whitefish Trail this year! We deeply appreciate our Corporate Sponsors and look forward to promoting our partnership in social media, in our newsletter, and on our website.